Many customers ask “how is removable pool fencing priced? How do I get a estimate for safety fencing?” Well there are a few easy ways to understand how much a swimming pool fence cost. The first no hassle way is to request a estimate through our online form. We will give you a call or an email to set up a fence or net estimate for your pool at no cost. The second way is to give us a call. Answering questions and giving suggestions is also no problem for our team. The Most Affordable & Trusted Name in the Removable Mesh Pool Fence Industry! You can never put a price on peace of mind when it comes to protecting your baby, toddler, child or pet from accidentally falling in your swimming pool and drowning. Inland Empire Pool Guard has the perfect pool-fencing system to keep your children and pets safe from the dangers of drowning, yet you'll love that it's the transparent swimming-pool-safety-barrier that doesn't obstruct the view and flow of your backyard landscaping. In many cities and states, the law requires swimming pools, spas, and backyard water features/fountains be surrounded by a pool-fence or pool child-safety protective barrier. The cost of Inland Empire Pool Guard's strong, durable and removable mesh pool fencing is very affordable making it the best child-protective investment you will ever make. The price of your safety pool removable mesh fencing generally averages around $1,200 with a wide range of options to choose from including colors. Pricing for Inland Empire Pool Guard's child-pool-safety removable mesh-pool-fence is very affordable, plus you get fast installation by our professional pool-safety experts. Inland Empire Pool Guard is The Best Child-Protective Investment You Will Ever Make! Standard Mesh Swimming Pool Fencing - Should always be erected by using a diamond core bit drill on a adjustable drill platform. The hole size comes in two different sizes, either 1 1/8 or 1 ¼. Major benefit of a core drill is a perfect no-chip hole and a fast installation. Inland Empire Pool Guard knows it's the California lifestyle to have a swimming pool for year-round recreation, entertainment and family fun. However, along with the many benefits of backyard swimming pools, spas, slides and water features comes the ever present issue of “swimming pool safety for children”. As a pool owner, you know you must accept the responsibility of taking active steps to assure that your swimming pool area is safe from your crawling baby, toddler, children or pets accidentally falling in and drowning. Inland Empire Pool Guard's Removable Swimming Pool Fences and Safety Swimming Pool Nets are cost-effective with prices that are very affordable in both Corona and Temecula. They also give you the flexibility for quick and easy set-up or take-down for backyard parties and barbeques, unlike Rod Iron pool fences which are permanent and can ruin your decks and landscaping. With Inland Empire Pool Guard's removable mesh pool fencing, you have the option to leave it up all year long, or set it up for special occasions, or just when the grandchildren visit. The cost to purchase and install your swimming-pool-fencing-system is something to consider, it doesn’t’ matter if you are in Menifee or Murrieta, however pool safety for children and pets should be seen as an invaluable investment. When it comes to affordable pricing and superior customer service and installation, Inland Empire Pool Guard is the safest removable mesh pool fence you can get for your money. The larger your pool area, generally your overall cost will be higher, but typically it's around $1,200 for the complete pool-fence system and self-closing, child-proof lockable swimming pool gate. There is a difference in cost between a 4-foot and 5-foot child-protective swimming pool fencing. Child-Safe Magnalatch Series-3 Key Lockable/ Self-Closing Gates are highly recommended by Inland Empire Pool Guard. If you are installing a large pool-fence enclosure you may have to also install more than one self-closing/child-proof lockable gate. Although you need to think about each of these points when determining the price; a child-pool-safety-fence price ranges from approximately $800, averages at $1,200, and starts to top out at $2,000 still an amazing price for your peace of mind. As a worthy investment, the cost of removable mesh pool fencing from IE Pool Guard pool fences is the responsible thing to do to protect your child or pet from accidental drowning in your swimming pool or spa. You know that you can't put a price on the swimming pool protection of your child and pet. I.E. Pool Guard knows how fast a crawling baby or toddler can move, this makes owning a swimming pool particularly hazardous for households with kids. While there is no substitute for adult supervision, Inland Empire Pool Guard recommends the best way to prevent child-drownings in residential swimming pools and spas is for pool owners to install a removable mesh pool-fencing system and child-proof, key-lockable safety gate. It's important to safeguard your family, friends, neighbors and pets from the potential danger of swimming pool drowning with reliable Inland Empire Pool Guard Removable Mesh Swimming Pool Safety Fences and Safety Pool Mesh Nets! Join the families, adoptive parents, Foster parents, grandparents, and child-care providers of San Bernardino, Riverside, Redlands, Ontario, Rancho Cucamonga, Upland, Fontana, Yucaipa, Loma Linda, Banning, Calimesa, Cherry Valley, Beaumont, Highland and the entire San Bernardino Valley who installed Inland Empire Pool Guard's Removable Mesh Pool Fencing Systems and are now enjoying the freedom from worry about accidental drowning. It's your pool-safety solution for your family, friends, neighbors and pets. A removable pool-fencing system from Inland Empire Pool Guard is a swimming pool barrier that helps prevent a baby, toddler, small child or pet from accidentally falling in and tragically drowning. A child slipping and falling into your swimming pool or spa area can happen fast, in fact by the time a child's absence is noticed, they may have already drowned. You must take swimming pool safety seriously, and take preventative-drowning action now! Divert a swimming pool drowning tragedy and call Inland Empire Pool Guard today at 909 800 6412 and get your child-proof removable and cost-effective mesh pool fencing installed right away. Inland Empire Pool Guard combines the professional pool-safety expertise and quality pool-fencing that you require for child safety with prices that you can afford. Your swimming-pool-fencing price is amazingly affordable compared to the security of children and pets from accidental drowning. Many pool owners from Temecula to Riverside worry that installing a pool fence will be expensive, but with Inland Empire Pool Guard, you get both child-protection and affordability. Swimming pools should always be happy and fun places for family and friends to enjoy. Unfortunately, each year thousands of families are faced with swimming pool tragedies of near-drownings or drownings of young children or pets. These tragedies are preventable with strong and durable Inland Empire Pool Guard's removable mesh swimming-pool-fencing and child-proof safety and lockable gates. The benefit of Inland Empire Pool Guard's Mesh Pool Fencing is that it creates a protective safety barrier between your home and your swimming pool yet the mesh is transparent allowing a clear view of your pool making. Unlike most permanent fences (like Rod Iron fencing), Inland Empire Pool Guard mesh pool-fencing has no foothold making it very climb-resistant for children. Kids can't climb Inland Empire Pool Guard's fence very well and accidentally fall into your pool and drown. That's reassuring! 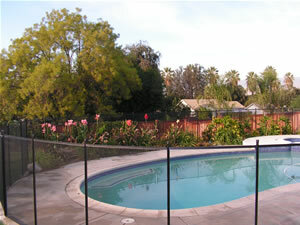 IE Pool Guard Removable Mesh Swimming Pool Fencing and Pool-Safety Nets around pools, spas and rock water fountains are preferred by Los Angles and San Bernardino Valley homeowners who want the safety benefits without the permanence of a typical fence like a Rod Iron Fence which can ruin and stain your deck area. Removable mesh pool fences have proven to be safe, strong, durable and gives you peace of mind knowing your children and pets are pool-safe with no risk of accidentally falling in the water and drowning. The professional pool-fence safety experts at Inland Empire Pool Guard are committed to protecting your swimming pool from a little child's drowning tragedy. Our mesh removable pool fences are ideal for pool-safety because they provide a strong safety barrier between your home, and your swimming pool/spa. As a parent, or someone who wants to adopt a child, take in a foster child, or be a child-care provider you're going to have to meet California's state requirements for securing a CHILD-SAFE SWIMMING POOL with professional pool fencing. Inland Empire Pool Guard knows that new mothers, adoptive parents, Foster parents or child day-care facilities need to protect children from accidental drowning by installing a strong removable mesh swimming pool fence (it's required by law). It only takes a few seconds for a crawling baby or toddler to slip into a pool and quietly drown. Inland Empire Pool Guard's system of removable mesh pool-fencing is recommended because it's constructed with strong and transparent material, has a climb-resistant nature, features a self-closing/child-proof Magnalatch Series-3 Locking Gate, and removable convenience. Your affordable-removable-pool-fencing from Inland Empire Pool Guard can be easily removed by an adult in minutes and stored away for a special occasion when a safety swimming pool barrier is not desired. Taking active steps to assure that your swimming pool is safe for children is smart and responsible. Inland Empire Pool Guard Is The Best Child-Safety Investment You Will Ever Make!